Bullhorn recently launched their Global Recruitment Insights and Data (GRID) site, showcasing the thoughts of over 2,000 recruitment industry professionals around the world. The survey presents many insights and identifies many concerns, but the recurring theme is a strong need for increased automation and candidate engagement. Let’s take a look at some of the key findings and how automation tools can help. 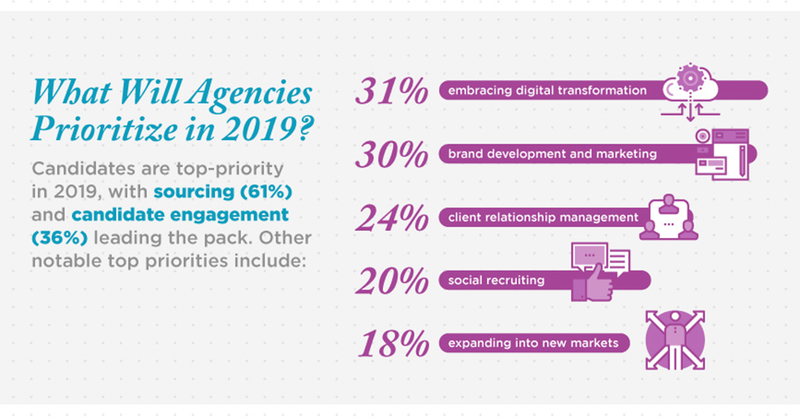 While sourcing remains the top priority, the industry is recognizing the increasing need for candidate engagement and automation. As it turns out, the second is the key to the first; use cases such as welcoming passively sourced candidates and re-engaging candidates already in your ATS help firms increase engagement quickly and efficiently. By automating communication at these touchpoints, firms can improve the candidate experience and essentially setup a safety net for every matched audience in the ATS. Technology is a bigger part of our lives than ever, and respondents know they have to embrace it to stay on top. 49% identified digital transformation as their top operational challenge, ahead of pricing pressure (44%). Automation technologies (ahem) make the digital transformation easy with intuitive yet powerful workflows to help you unlock the full potential of your ATS. This [automation] is a disruptive force. We’re going to have disruptive capital. And the organizations that aren’t able to adopt automation will perish. They won’t be able to keep pace with their competition. Through middleware services like Zapier, automations can also interact directly with your other technologies, removing the need to manually import or export data. 64% of respondents identified Gen Y and Z candidates (aged 37 and younger) as hardest to reach and engage. Part of this difficulty stems from the different technologies they embrace; younger candidates are more likely to prefer being contacted via text. Engaging this growing section of the candidate market requires a text-friendly strategy, but it can be difficult to avoid texting faux pas with a manually run campaign. Carefully structured workflows can help by applying best practices as rules, removing the potential for human error and avoiding potential breaches of etiquette. In an industry as relationship-driven as staffing, automation can’t drive success on its own, and it can’t replace your key personnel (David Autor gives an excellent explanation of why in his TED talk). I still believe at its core, staffing is very much a people business. You have to stay in touch, you have to talk to people. If you’re just texting or you’re just doing nurturing campaigns and things of that nature, you’re not gonna be able to build a rapport. What automation CAN do is unburden recruiters by taking care of the routine activities which might otherwise consume much of their time. This leaves them free to focus on strengthening their relationships with candidates, contractors and customers. The Time to Automate is Now! There are multiple ways automation can impact your business. The first step is understanding the current gaps or time-consuming activities in your recruiting process. From there, planning out your goals (save time, drive more re-deployments, improve the candidate experience etc…) and outlining each step gives you a blueprint to build your own recruiting automation machine. If you’re looking for a starting point in planning out your recruiting automation engine, download our Recruiting Automation Workbook by clicking here.